Over the past few weeks, we've had a lot of feedback about our paper describing the sorry state of Excel auto-correct errors in supplemental files in spreadsheets. In our group, we've discussed a number of ways that these errors could be minimised in future. 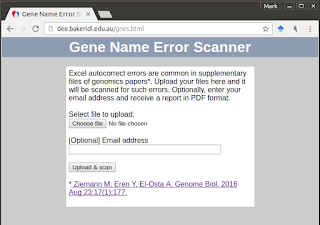 One suggestion was to publish a webservice which permits reviewers and editors to upload and scan spreadsheets for the presence of gene name errors. So that's what I did. I took some basic file upload code in php and customised it so that it runs the shell script described in the paper. You can access the webservice here. We've been testing it for a few days and seems to work fine, except for the auto-generated email which I presume is being blocked by our IT group. 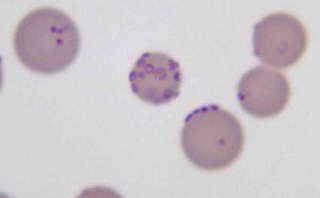 Upload spreadsheets and have them scanned for gene name errors. Some responses to journalist questionsList of media coverage and whether they are reporting things accuratelyA look into the scripts used themselvesFuture directions I'll also be answering your questions, so pop them in the comments section. Small RNA expression is difficult to analyse. They're small molecules anywhere from 18 -25 nt for miRNAs, they occur as identical or near identical family members and are subject to RNA editing as well as errors from the sequencer. My recent paper is an analysis of alignment tools for microRNA analysis with a strong focus on uniquely mapped reads. All that's OK, but in some organisms such as grasses (rice, barley, wheat, etc) you'll find that multimapped reads far outnumber uniquely placed ones. If you omit multimapped reads from the analysis, then you'll be excluding the majority of reads which is definitely a bad idea in any NGS analysis pipeline. To demonstrate this, I downloaded smRNA-seq data from SRA (SRP029886) that consists of 3 datasets (SRR976171, SRR976172, SRR976173), clipped the adaptors off and mapped them to the genome with BWA aln then counted reads mapped to exonic regions uniquely (mapQ≥10). Over the past few years at GenomeSpot, I've evaluated alignment software accuracy for DNA-seq, RNA-seq and small RNA-seq. After discussions with colleagues and followers, I thought it was time to develop aspects of this work to a point where it would be publishable in journals. 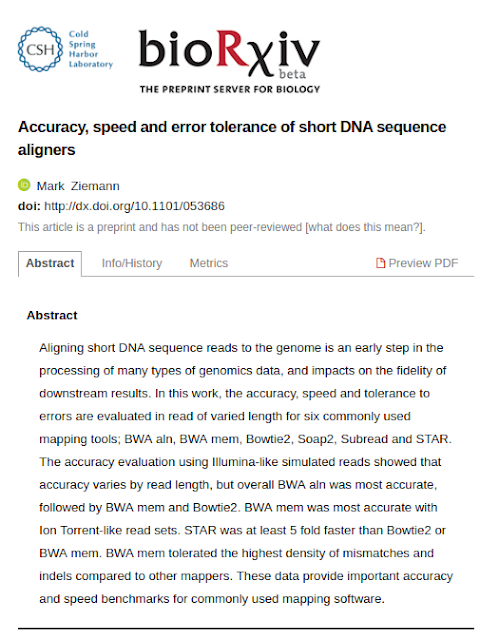 Over the past year I've put together a paper that comprehensively evaluated accuracy of small RNA aligners. After three review and revision cycles I'm happy to say it has been accepted for publication in RNA. It will likely appear in the August issue. Previously I wrote about how to make a gene expression rankfile using the unix shell. While this works for me just fine, there are some differences in the behaviour of shell tools like awk an sed that make it unusable for mac users. Therefore, I think the best solution is to show you how to do this in R, which you can install on Linux, Mac and Windows systems. The expression data for this demo looks like this (the first 5 columns). Is paired end RNA-seq better than single-end for gene-wise gene expression analysis? Something I've wondered about is whether for RNA-seq it's worth forking out the extra cost of sequencing both ends as opposed to single end. To test this, I went back to a paired end data set present in GEO (GSE55123, 2x 36bp), cleaned the data with Skewer, then mapped the reads with STAR in either paired-end mode or single-end mode (using just read 1). I then used featureCounts to quantify number of tags aligned to each gene. I excluded genes with fewer than 10 reads per sample on average. Then I ran edgeR at Degust to identify differentially expressed genes (DEGs@FDR<0.05). I used a shell script to quantify the overlap in DEGs. Then I ranked them based on the p-value from most up-regulated to most down-regulated and compared their positions in the rank. Here's the result of the overlap analysis. 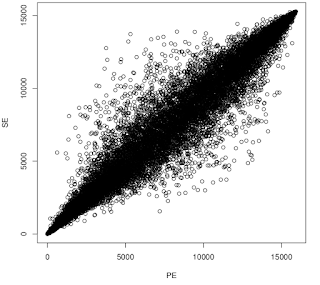 You can see that PE fastq detected more genes but identified fewer DGEs than SE. Its that time of year again where we can reflect on the year that was, hit the reset button and focus on the trend that will dominate 2016.